A few newsworthy notes from this past week. The Minnesota PCA said Minntac does not need to do a full-blown environmental impact study to enlarge its mining area. U.S. Steel is planning to expand the mine by 483 acres to access more ore. This will expand the life of operation by 16 years. Minntac is the largest producer in the state and employees around 1,400 workers. CN handles 4-5 pellet trains per day out of the plant and delivers at least one loaded limestone train per day. In the summer roughly 120 cars of BFT are loaded daily for Two Harbors. Here is the update: Keetac is down the 2nd through the 16th. Last train will load tomorrow using pellets in cycle. Hibtac is taking a line down the 14th through the 28th and will run one all-rail a day 6-10th. Minorca is also shutting down this week for two weeks. Looks like BNSF has hired R. J. Corman to install a new culvert at the washout just west of Riverside Junction. They had a cat and an excavator working there today with two shiny culverts sitting off to the side of the road. It looked like they were going to put one under the LS&M tracks as well. Here is what the washout looked like. Today I heard a limestone head out of Proctor with what sounded like 3 SD40-2Ws and an SD40u (I wasn’t sure on the last one). The limestone sets have had some variety lately, such as this one earlier in the month grinding up Proctor Hill. 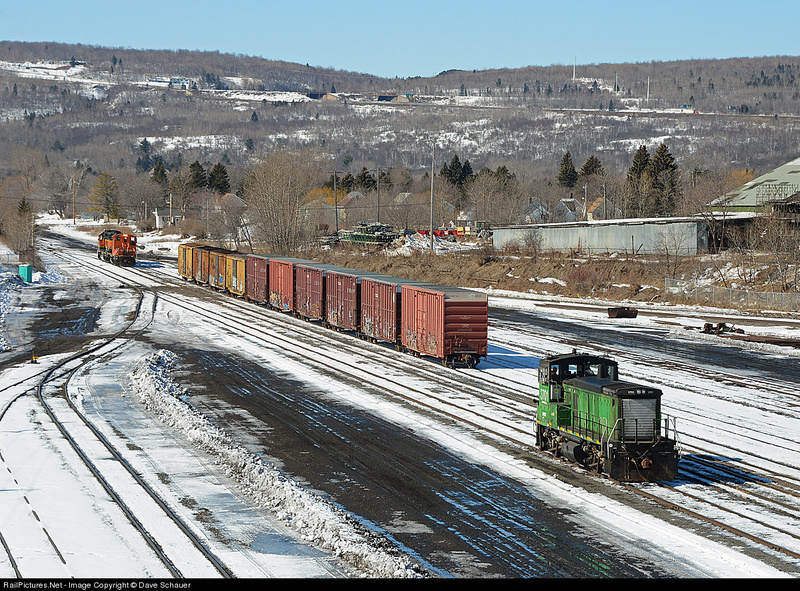 Yesterday it was an Indiana Railroad EMD at Stinson and today it is a NS EMD at Belknap. It was in a good spot for shots from the public road around 2PM. Milky skies are slowly clearing but have been persistent (blue sky just to the west though). 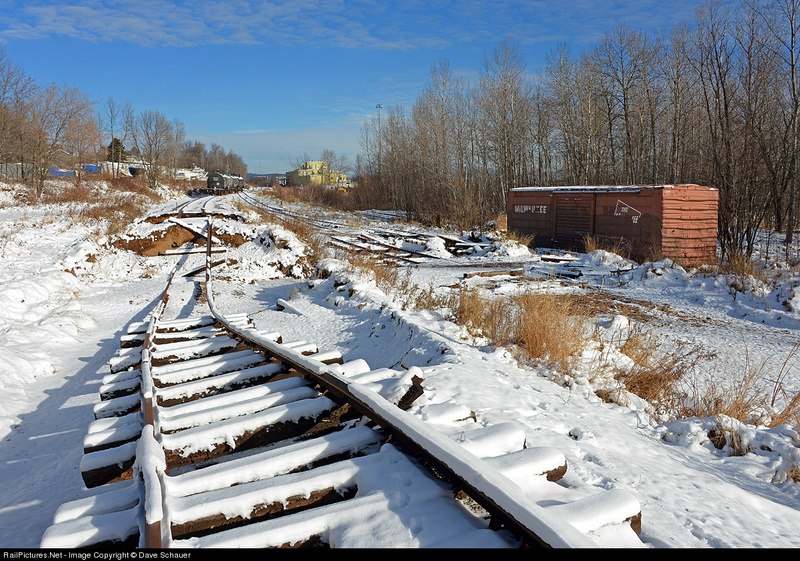 Unconfirmed but reliable reports indicate CN has sold the Ashland Subdivision to Genesee & Wyoming. 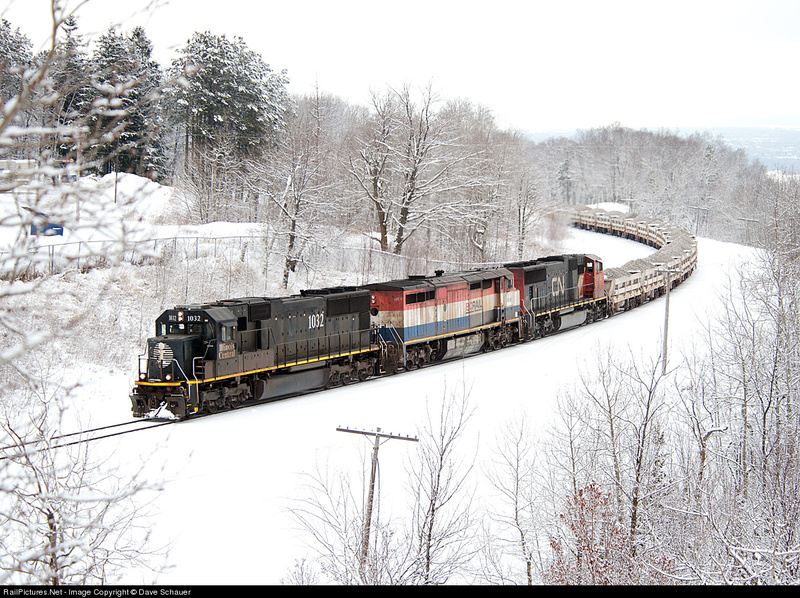 G&W had made an offer to buy these lines in the past but CN set the selling price high as they waited on possible buyers for White Pine and the development of a taconite plant. Included are the mainline from Tomahawk (Tomahawk Railroad is a G&W property) to Rhinelander over to Prentice then north to Ashland plus the White Pine line. It can be assumed CN has some clause in the agreement that allows them to reclaim the line or at the very least operate over it should major traffic materialize (i.e. Gogebic Taconite). These lines being captive to CN also likely helped G&W's case for a spin-off. Makes one wonder with the Empire Mine closing how much longer the secondary lines in the UP will last under CN ownership. 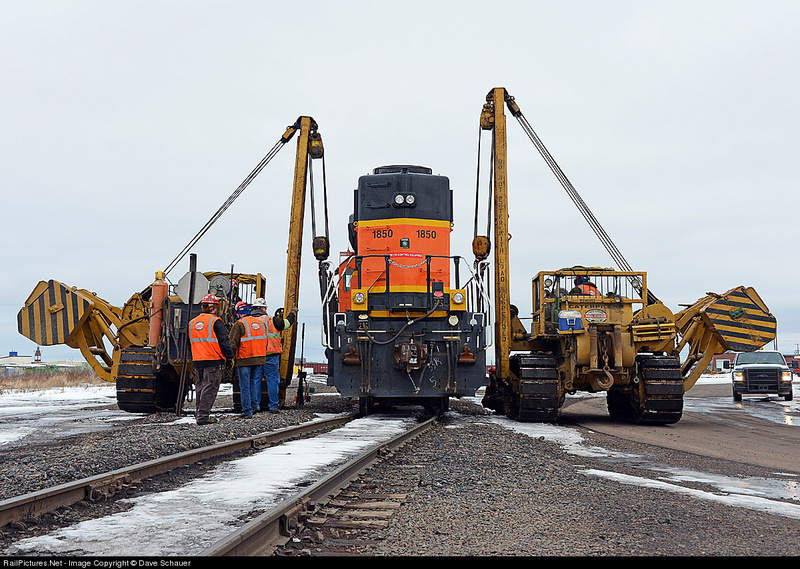 BNSF B&B and a private contractor made some nice progress this past week with the delivery of bridge parts. Interesting shuffle today at Mikes Yard as a hostler brought over a GP38 and swapped out the 3701 on the Paper Mill Switch. 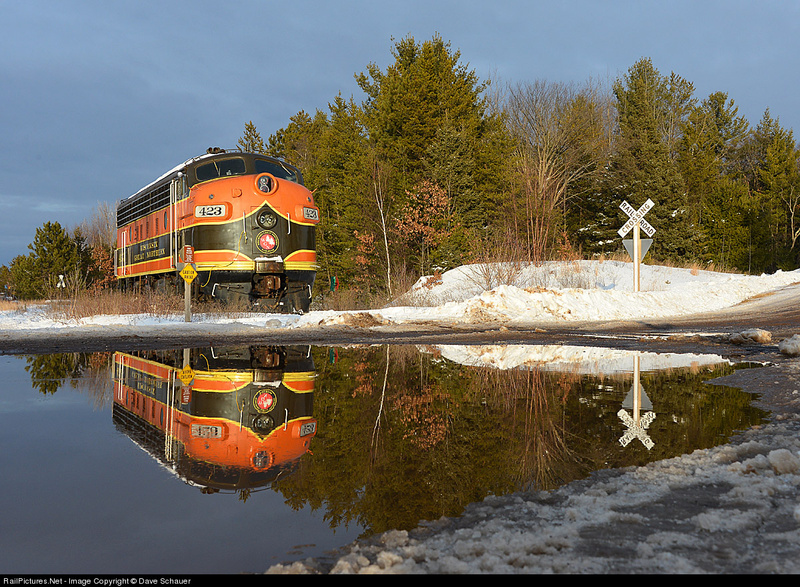 The green MP15 then headed back to Superior likely for some attention while the geep and sister 3702 remained to complete their assigned chores. Nice beautiful code blue day for those out shooting (and with mild temps to boot). BNSF put one of their terminal SD40-2s on the ground just off Winter Street on the car shop lead and I happened to catch Hulcher taking all of five minutes to get it back on the rails. Figuring it probably took them 3+ hours to get here from Hudson it seems silly for a job that took a few minutes. At the southern end of the TPR coverage we stopped by Spooner on the way back from a trip this weekend and checked on the status of Greg Vreeland's new depot north of town along highway 53. He plans to add a track here for his B&B sleeping car train as well as additional tracks for loading of passengers. The depot will have the classic lines of a small town station and be a big upgrade from the current Spooner facilities (offices, indoor seating, gift shop, nice restrooms, etc.). The increased visibility from highway 53 will add greatly to his business potential (he plans some big signs and you will be able to see the north end of the train from the highway). The nice pines will shelter the B&B train from the noise of the highway. We also lucked out in that he is moving some stored freight cars this week and had just shifted his F7A out to Trego. The sun came out a few minutes after we arrived and the spring melt allowed for some really nice shots.